Student teaching is rougher than I imagined, but as I do more actual teaching (as opposed to observing and being the “extra eyes” in the room) I am improving. Somewhat. It is clear I have a long way to go, in both developing lessons and delivering them. On the other hand, I am seeing progress, both in myself and in the students. Seven more weeks to go in this go-round, then a quarter of being just a student again, and one more student teaching in the spring. For now, we’ll assume it will go as planned. Meantime in the family, we have two students in the same school again, although the elder son is more than half-time at the community college rather than high school. It is nice, though, to have one bus schedule (and school schedule) to remember for a bit. Both in the band, both considering debate this year, both enjoying being with their friends after a long summer. 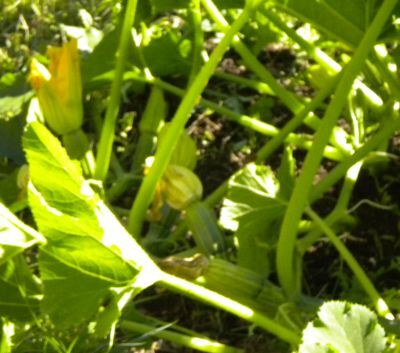 Meantime in the garden, we have squash! and apparently pumpkins. 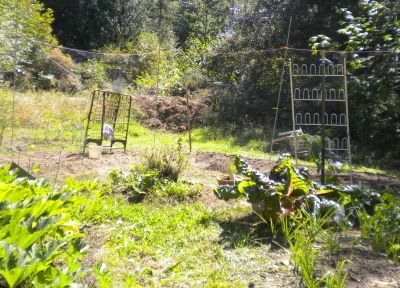 And swiss chard and lettuce, cucumbers, potatoes, various herbs and flowers, and in the wings, if they can outgrow the hungry baby slugs that finally appeared in the last month, broccoli, cauliflower, cabbages. I was fortunate, the day after I wrote the previous post to have a lovely warm afternoon. I remade the scarf that didn’t turn out and improved the design as well as the color. Constant refinement, in arts as in life, provides both variety and opportunity. I didn’t take any pictures, though. Not enough time. The beautiful goldfinch that sat in the medlar last weekend while I worked on lesson plans? The mists that hang heavy in the morning and many evenings already? The long commutes most mornings that get me up three hours before the school I am teaching at begins? Or the long commutes most evenings that see me home sometime after everyone else is long ready for evening recreation? It’s raining again, more than 6 inches since it began earlier this week. Soon the boggy area down by the road will fill with water and the frogs will stop singing. The maples will turn a brilliant yellow and the (non-native but now ubiquitous) sweetgum an eye-popping scarlet. If we are lucky, there will be a few days of glorious sun while the colors are on the trees. And then the landscape will rest, and bid us do the same. Meantime, there is research to do, lessons to plan and deliver, and a family to tend. So, the squash continue to grow well, and the pumpkins seem to not be falling off quite so rapidly since I added calcium carbonate. I think there is hope for a small, late crop. 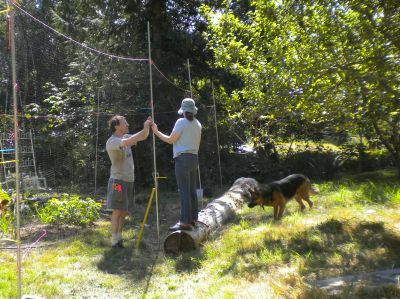 Today, Tom and the elder stidkid worked very hard in the garden this morning while I was working on schoolwork (yes, already). 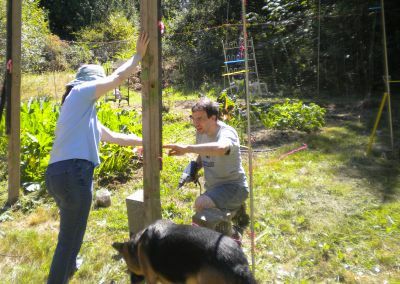 Here are a few pics stidkid took, including some of me helping with the fence repair. 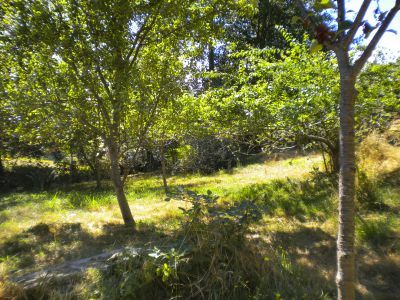 And last but not least, the orchard that is just up the hill (west) of the garden. Not much fruit this year, but abundant lovely dappled shade. I love planning my garden! So many possibilities! And what I don’t do this year, I may do next. Well, it’s something that takes a while for me… I have been mulling things over all week. I have read articles on people making resolutions (for about a month pre-new year they appear in various publications), and goal-setting and such, and thought about them.A few days ago, I added an interesting widget to my site on the Cool Things page (or you can go directly to the website that hosts it: Joe’s Goals. It will help me track the things I am actually accomplishing each day and week. A bit of incentive, since now the whole world can see what I am up to — and what I actually manage to do. But I am holding back from actually making any promises about specific goals or resolutions for this year. Why? Because there are many uncertainties in my life right now, and I want to be consistent and steady, not new and improved. A lot of us make HUGE promises on a regular basis. We start the new year (or season or job or…) with the best intentions, we’re going to lose weight (or get a new job or declutter the garage or…), and when, after a couple weeks we lose steam and things don’t seem to happen as fast as we wish they would… everything sort of falls apart. I am speaking here of people who are from the United States (though other cultures have similar heritage), with the social conditioning to work very hard without complaining and rely only on oneself: the puritans were strong believers in perfecting oneself. I think those of us from that cultural heritage are caught in an impossible trap. And it’s one that many spiritual and political leaders have perpetuated without thinking about the implications. There are two flaws, two specific ways of thinking that both lead to the same result. The first is that if one doesn’t do what they said that all is lost. We can see this in children (and their parents) who fixate on making straight As… the first B that shows up on a report card collapses their plans and self-esteem. All-or-nothing thinking falls apart as soon as “all” becomes impossible. The second error in thinking is that there will always be another day… another opportunity. The sad truth is that if I pass up this opportunity to stop and visit with a friend he may be gone the next time I have a chance. If I put off tilling the garden in March, it simply won’t be ready in April when it’s the best time to plant cabbages, and any cabbages I manage to get planted (late) will be small and bolt before they reach the right size. “Tomorrow” may NOT come, so I really should do what I can today (within reason, see below). Both ways of thinking can lead to the same result: NOTHING. Give yourself permission to take “holidays”- or fail – and stick to the program the rest of the time. For example, if I decide to work out at the gym five days a week instead of the three days I had been, I also give myself permission to miss three days a month. This way, if I am sick one day, or just tired/distracted/busy, and don’t make it to the gym then I am not guilt-ridden the next day. But limiting my “bye” days is important, so I don’t just take a whole week off every other week! Also give permission to change goals mid-stream. Perhaps I start the season with good health, but get influenza halfway in. For me, it takes at least six weeks to regain my energy levels. During that time, I really can’t do as much as before. So, until my energy returns to normal, perhaps I change my work-out routines to be more stretching, and drop back to two days a week for aerobics, and re-evaluate my progress when my health returns. Remember that what is right for me is not right for others. I spent years with extreme back pain. I simply cannot do certain types of exercises without landing in bed on an ice pack. And the sort of neat house that was both possible and appealing to my grandmother is TOO neat and tidy for my comfort level. My goals and resolutions are not an opportunity for competition, they are to help me feel better about myself, to enrich my life. If they make me MORE miserable, then I have either the wrong levels set, or just the wrong goals. Review your progress on a regular basis. Once a year is not enough to stay on top of problem areas, once a week is probably too frequent to get perspective on over-all trends. Every two or three weeks (depending on the goal) to once a month would let you see progress and problem areas (in time to make changes), and re-evaluate both the status of the projects and whether they are reasonable. Get someone to help you. Some folks like exercise buddies, some folks meet up once a week to discuss their successes and failures. I have put the Joe’s Goals gizmo on my website so interested folks can see what I am up to. For me, making it more public is good incentive. Having a sympathetic ear, or a “coach” of some kind can be a good way to both get an incentive to make goals and to gain perspective on where you are heading. The last bit is: be patient with yourself. You aren’t going to get everything done easily if you have set reasonable goals. If you DO get everything done, your goals are too low. If you get no sense of accomplishment or always feel you are behind, then your goals are set too high. You should have to stretch a little bit on a regular basis, but not so far or so often that you end up exhausted or disillusioned. Anyway, that’s what I think. That’s why my resolutions are to maintain course this year, to maybe get a part-time job at some point to help finance children’s activities and art supplies, to be more diligent in stretching exercises to prevent injuries when I am working in the garden. I hope you have a successful, prosperous new year! Blessedly uneventful. Was able to spend some time reading and catching up on email and news. Well, pretty much. Was able to speak with school principal about something I was worried about. Was able to speak with specific teacher about the same something. We are all on the same page and matter should be resolved with luck before the end of the school year. Tutoring own kid has its advantages… like using school time for the tutoring! Kid is almost caught up to the rest of the class. Another week may be enough. Same kid forgot this was a Knowledge Bowl day, so I made an extra trip to the school to take a snack and some cash for the customary stop at Dairy Queen (the only time this kid ever goes places like that!). Decided to run some errands while I was halfway to town anyway, and won’t have to leave home tomorrow except for the tutoring. Did I mention that he is almost caught up? This might be the last week I need to be at school on a regular basis. Lovely dinner tonight, soup (chicken, hominy and chorizo sausage) and souffle (two layers, carrot and broccoli). Kid’s knowledge bowl team won the day’s event. Tomorrow? hopefully I’ll have the energy to clean the house a bit. It got somewhat disheveled over the kids’ vacation!